Use GIANT, wild colored letters to create a welcome sign that no one can miss! Each letter is about 13" tall. The whole word (including the exclamation point) spans about 6' long, and longer if the letters are spread out! 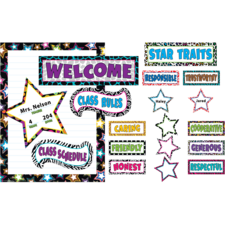 Includes 33 multi-purpose blank cards (6 1/2 x 2 1/2) and a teacher's guide. 41 pieces total. Great product and super cute!! The letters are a nice size and I'm using the tags to identify the kids' desks. Neat package.